You have been using Sony Xperia Z2, Z3 for several years and decided to pick up the newest Samsung Galaxy S7/S7 Edge for a change. Then what are you gonna do with all the data in old phone? Exporting to the new one? Naturally, it is difficult and time-consuming to move different types of data between 2 handset. Thus what you need now is reliable & professional phone data transfer tools for Sony and Samsung. 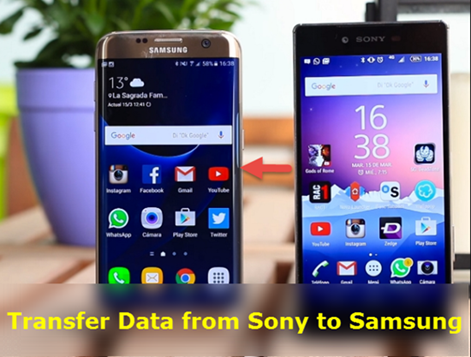 This post will walk you through 2 programs for transferring data from Sony to Samsung devices. Jihosoft Phone Transfer is highly recommended to meet your demands. With this tool, you can move almost all data from Xperia to Samsung in a few clicks. Besides, it is applicable to many android phones, such as Samsung, Sony, Huawei, LG, Motorola, HTC, etc. 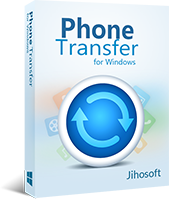 Step 1: You are required to install this phone transfer program on your mac or windows. After installation, launch it and click “Photo to Phone” option. Step 2: Using 2 USB cables to connect Sony and Samsung to computer and the 2 devices will be automatically detected by this program. Step 3: Select the data that you want from the file types and click “Start Copy” to transfer data Sony Xperia to Galaxy S7, S7 Edge, S6, Note 7, Note 6, etc. Samsung Smart Switch is developed to move contacts, musics, photos, calendar, text messages, device settings and more from android phone or iPhone to your newest Samsung Galaxy devices. Step 1: Install and launch this app on both of your old Sony and new Samsung. Place them beside each other. Step 2: Respectively set Sony and Samsung as “Sending Device” and “Receiving Device”. The 2 devices will be automatically or manually connected to each other. 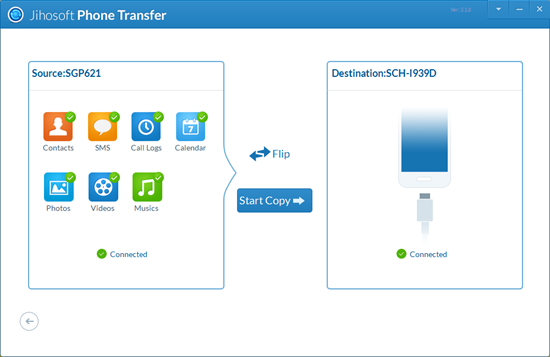 Step 3: Once the connection process finished, check the items you wish to transfer and click “Send” to move data from Sony to Samsung. 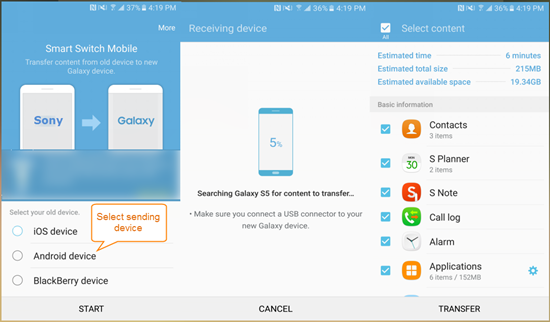 What Devices are Supported to Transfer Data to Samsung Through Smart Switch? Samsung devices with Android 4.0 or later versions. Any other android devices, like LG, Sony, Huawei, HTC, etc.